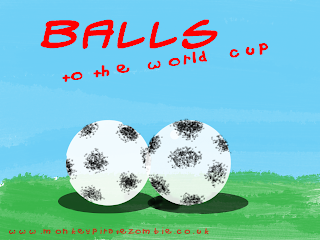 Balls to the world Cup! Monkey Pirate Zombie will be one of the few UK based sites not to be swept up in World Cup fever. The World Cup is I believe a 'Kickball' tournament in which the Kickballers try to kick the ball (with their foot) into the Ball-hole. People everywhere (except Americaland) tend to make a big fuss about it for some reason, even though it is not AT ALL IMPORTANT. Kickballers get paid a ridiculous amount, presumably because it's such a horrible job, and they have to run around outside in the cold. Joking aside, we will be a football free haven, and to celebrate our indifference, I've made this poster.Print it and stick in your window. Stick it on a flag outside your car. Stick it on your facebook profile. Show the world that you don't care!